About four years ago, we (Pure Storage) released support for our asynchronous replication and Site Recovery Manager by releasing our storage replication adapter. In late 2017, we released our support for active-active synchronous replication called ActiveCluster. Until SRM 6.1, SRM only supported active-passive replication, so a test failover or a failover would take a copy of the source VMFS (or RDM) on the target array and present it, rescan the ESXi environment, resignature the datastore(s) then register and power-on the VMs in accordance to the SRM recovery plan. The downside to this of course is that the failover is disruptive–even if there was not actually a disaster that was the impetus for the failover. But this is the nature of active-passive replication. 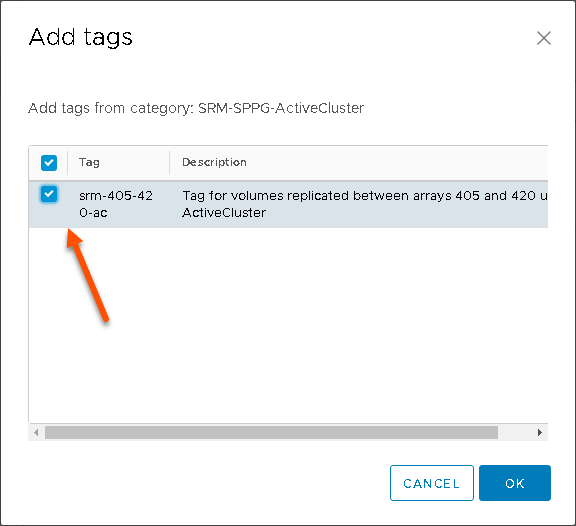 In SRM 6.1, SRM introduced support for active-active replication. And because this type of replication is fundamentally different–SRM also changed how it behaved to take advantage of what active-active replication offers. 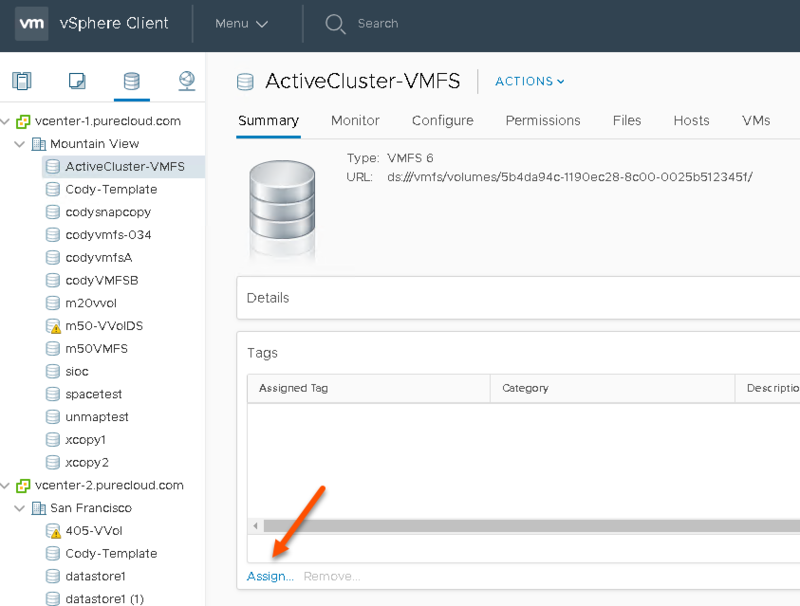 In this blog post series, I will walk through setting up ActiveCluster, configuring vCenter, configuring SRM and then walk through the failover and test failover process. 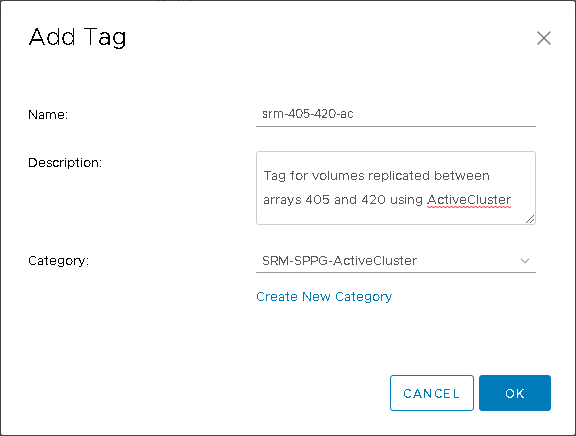 This post will be on setting up ActiveCluster and configuring vCenter and your datastores/VMs for use in SRM stretched storage support. That volume is currently not replicated on my FlashArray. So let’s walk through setting it up. Starting with ActiveCluster itself. 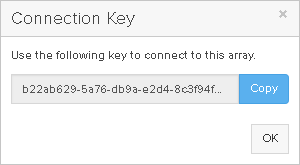 The first step is to enable a synchronous connection. Pick one of the two arrays (doesn’t matter which) and login. Side note: you can certainly do this via the REST, PowerShell, the CLI, or any other scripting method, but I will walk through in this case with the GUI. Create the connection in the GUI by going to Storage > Array > Connected Arrays. Click on the plus symbol. Then populate the fields. You need the virtual IP of the remote FlashArray and a connection key–both of which can be retrieved from the other FlashArray. Enter the information into the window and click Connect. The next step is to create a pod. A pod is a namespace/consistency group for volumes you would like to replicate with ActiveCluster. 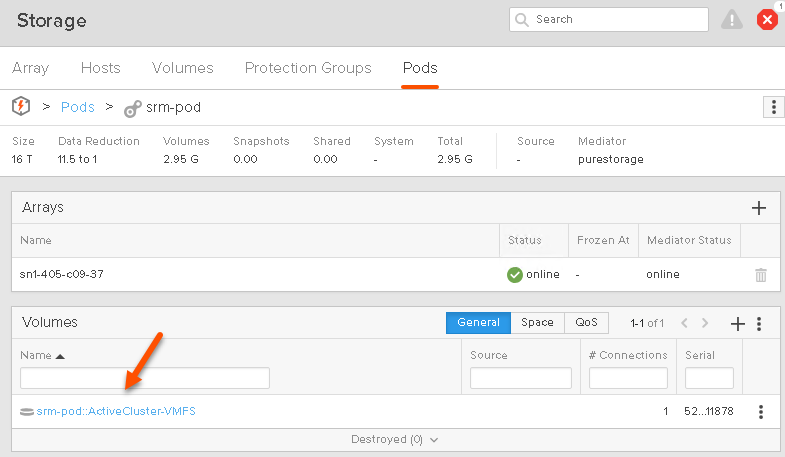 Go to Storage > Pods then click on the plus sign under Pods. Then give the pod a name and click Create. The pod is not yet enabled for replication–before we do that though let’s put our volume in it. So identify any volumes you would like to replicate and add them in. Go to the volume and click the vertical ellipsis and then choose Move. Choose your pod and click Move. This will put the volume into the pod. The main difference is that you will see it has been renamed with the prefix of the pod name. As of Purity 5.1.2, you cannot move volumes into a pod that is already replicating, which is why I moved the volume first. So identify volumes you want to replicate and add them in. Once the pod is stretched, you cannot move any more existing volumes into it. Though you can create new volumes in the pod after it has been enabled for replication. 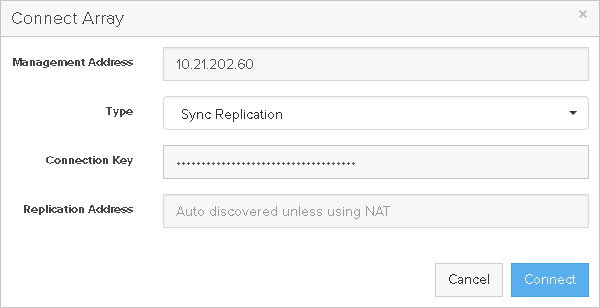 Temporarily disable replication, add the volumes in and then re-enable replication. Doing so will NOT require a full re-sync. Create a new pod and put them in there and enable the new pod for replication. 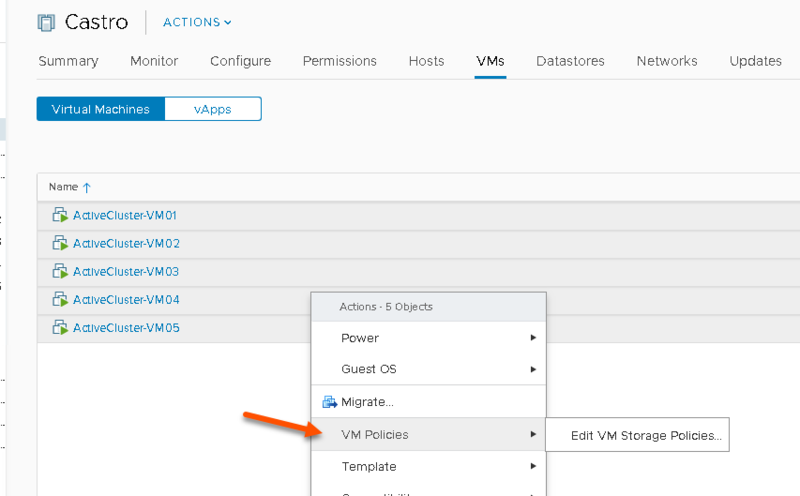 Create a new volume in the pod and put VMFS on it, then Storage vMotion VMs into the new VMFS and delete the old one when it is empty. The last step is to enable the pod for replication. We call this “stretching” the pod. Click the plus sign in the Arrays box and choose the array you want to replicate this pod to. Choose the array and click Add. The arrays will now sync the data. The state will be resyncing until it is complete. The array will send over the data while still maintaining dedupe and compression across the wire. When complete, the status for both arrays will be listed as online. The pod and its volumes are now on both arrays and both arrays can now serve reads/writes simultaneously for the included volumes. Furthermore, you can manage the pod and the volumes from either array. If you resize a volume, it is resized on both arrays, if you take a snapshot, that snapshot exists on both arrays. You’ve now fully set up ActiveCluster! Let’s set up vCenter now. Site Recovery Manager with stretched replication behaves slightly different than it does with active/passive replication. If a VM has a RDM, that volume will be included in the group with the VMFS that hosts the VM. 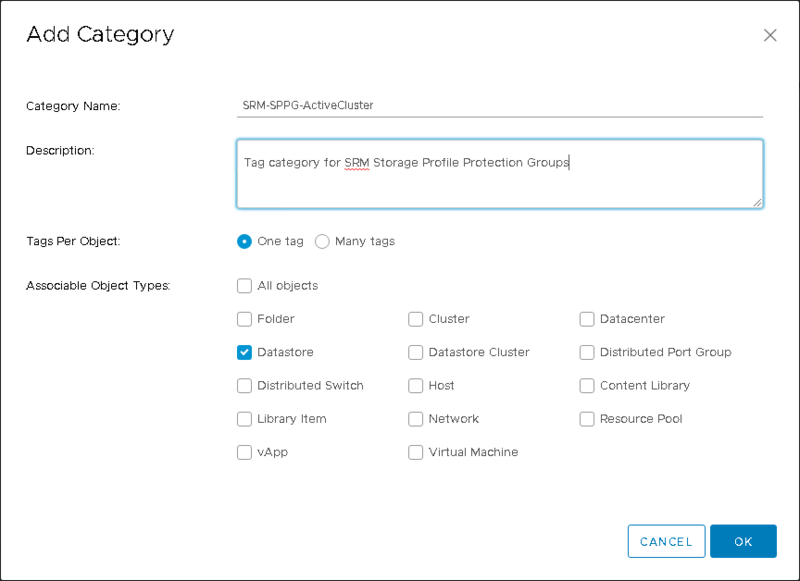 In short, you don’t really choose datastores, or really directly VMs, you choose a VM Storage Policy and then any VM in that policy will be included in the SRM protection group. This makes it easier to dynamically add and remove VMs or datastores as SRM really functions at the profile level, not the datastore level. Though remember the same rules still do exist–all of the datastores in that policy need to be replicated or else failover will, well… fail. First step is to create a tag and tag group. I will show the process in the HTLM-5 client, but the process is fairly similar in the flash/flex vSphere Web Client. 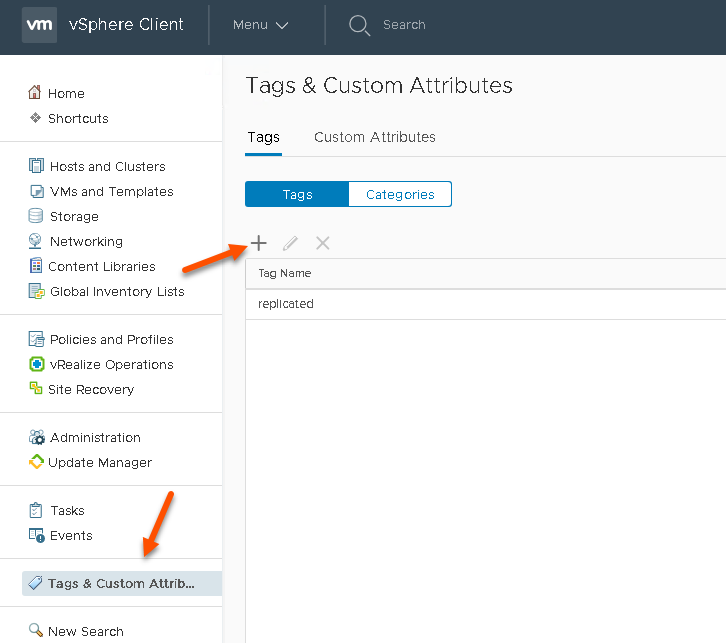 In the vSphere Client, go to Tags & Custom Attributes and click the plus sign to create a new tag. Next give your tag a name. Generally make it somewhat clear about what is replicating. Use the name and the description to your advantage. Make it clear it is for SRM and generally I would recommend indicating some replication configuration there too. The next step is to choose a category, if you already created one, then choose it. If not, create a new one. Give the category a name–usually include SPPG in it so it is obvious this group is for SRM groups. Choose One Tag as you only want one of these per datastore and choose type datastore. Click OK.
Change the category for the tag to the newly created one (or your pre-existing one as the case may be) and click OK. The tag and tag category are now created. To use stretched storage with SRM, both vCenters must be in Enhanced Linked Mode. This is to allow SRM to run cross-vCenter vMotions. In ELM, when you create a tag and a tag category–it will be replicated automatically to both vCenters–so you only need to create these once. The next step is to assign the tag to your datastore(s). Go to the Storage view and find your datastore(s). Click on your datastore and then the Summary tab and then click Assign… in the Tags box. Find your tag and select it and click Assign. Repeat this as necessary for any datastore you want SRM to control. 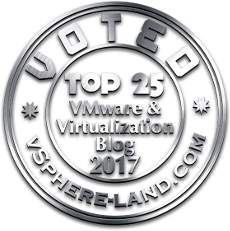 The next step is to create a VM Storage Policy. VM Storage Policies are the unit of failover, so all VMs in a policy will be failed over together. 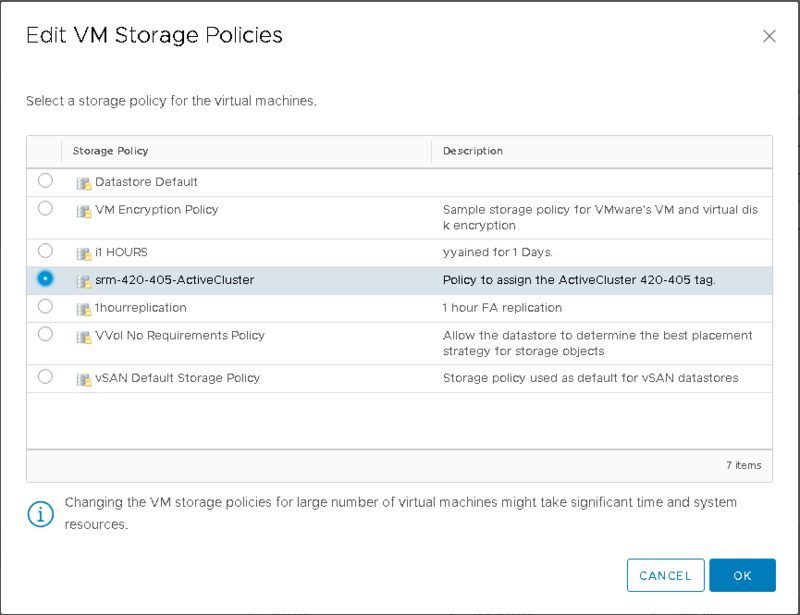 Go to Policies and Profiles, then VM Storage Policies and click Create VM Storage Policy. Choose the vCenter and then give it a name and description. I would recommend making it very similar (in name and description) to the tag you want to include in the policy. 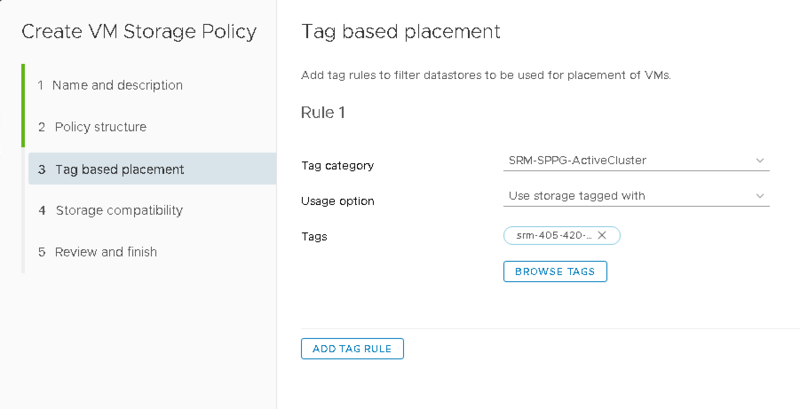 Click next, then choose “Enable tag based placement rules” as this will be a tag-based policy. Now choose the category and keep “Use storage tagged with” as the selection. Then click Browse Tags. Click OK, then Next on the original screen. The next screen will show you if you have any compatible datastores. If you tagged a datastore with the selected tag, it will appear here. If none show up, or you are missing one, it means either you didn’t tag the datastore, or you chose the wrong tag, or you are creating the policy on a vCenter that does not see that datastore. Note that you need to create this policy on both the source and target vCenters! 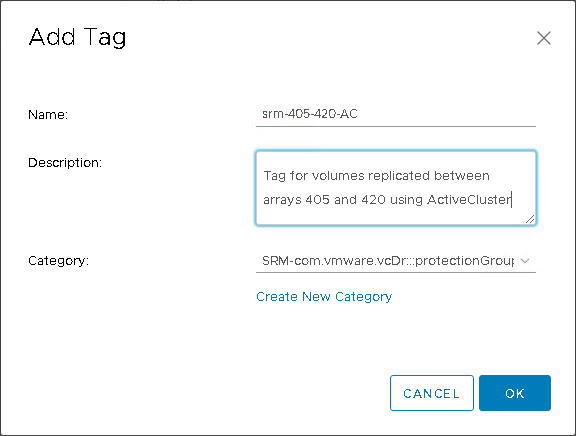 Unlike tags, policies do not get replicated between vCenters–you must explicitly create them on both. The last step is to assign the policy to your VMs. There are a few ways of doing this. If you have them all in one list, you can hold the CTRL key and click the VMs you want, then right-click and choose VM Policies then Edit VM Storage Policies. Choose the right policy and click OK. The next part of this will be how to configure Site Recovery Manager itself to use ActiveCluster and these policies. I have tested same active active setup in environment. I had 1 ESXi at PR and 1 ESXi at DR. vCenter is configured in the ELM mode. I tested vMotion is working fine on the stretched volume [Pod Volume] and ever tested with SRM as the blog mention and it was smooth. If I loose the ESXi on PR then what will trigger the VM to get active on the DR ESXi ? What configuration need to be perform on the Vcenter Client in ELM mode so that even if complete ESXi cluster at PR goes down then the PR VM present on the stretched Datastore remain active ? Hello! If you are using SRM, then nothing will trigger and automatic failover–you will need to initiate it with SRM by running a failover operation. This is a benefit of doing stretched clusters instead of SRM–it will automatically failover affected VMs if compute resources go down. 1. Can we do Live vmotion between our two data center to future data center for a VM which is running on ? Does your ESX cluster stretched between Primary and DR site when you did live vmotion using Pure Active cluster?